You know, the world is strange – beyond strange. Near every conception I’ve held toward life since I was a little kid has turned out to be wrong when subjected to close inspection. Take the most common thing in the world – getting up out of your chair and walking around. Sounds so simple doesn’t it? We do it everyday. We get up and go to our jobs, navigate the hallways, make it to our office, and do our work. But the more neuroscience I study, the more I realize how mistaken we are when we look in the mirror. We’re not what we think we are. I’ve spent all day today reading a textbook of mine called Neurological Foundations Of Cognitive Neuroscience. (All quotations found within this post will be from this text). Basically, it’s a compilation of research papers related to what happens when various areas of the brain are damaged. It turns out that your brain is responsible for near every capability you have. This is one of those things everyone knows, but doesn’t know. They know their brain is involved in their life, but they don’t realize that it’s pretty much everything that they are. Your brain consists of all these modules and if you suffer from say a stroke, and the brain cells of those modules die, you lose abilities to do all sorts of things – things you rarely (if ever) even think about. My primary area of research these days is related to object recognition and spatial perception/cognition. I’m interested in how we perceive objects (such as a table, a desk, a book, whatever), link them together in spatial environments, and tie them together in sequences which we experience as time and our memories. Well I spent all day today studying a variety of disorders, and I’ll take a little time tonight discussing what are called topological disorientations. This has to do with things which go wrong when we’re “way-finding”, which is how we perceive the world, arrange it into space, and then navigate it, starting at point A, and moving toward our destination point B. Let’s talk about how various forms of brain damage in select areas can leave you incapable of doing this everyday task. If you develop a serious lesion in any of the numbered areas, you’re going to face serious difficulties getting around. First, let’s introduce each area, and then discuss what happens when that area is damaged. Area (1) is the posterior parietal cortex, and it’s associated with what’s called egocentric disorientation. Area (2) is the posterior cingulate gyrus, and it’s associated with heading disorientation. Area (3) is the lingual gyrus, and it’s associated with a disorder called landmark agnosia. Last but not least, Area (4) is the parahippocampus, and it’s associated with aneterograde disorientation. 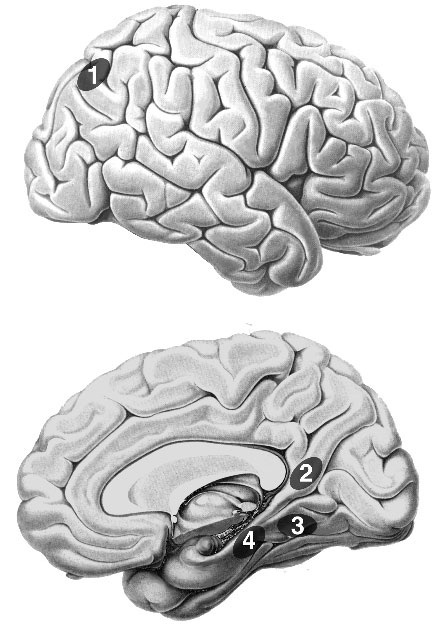 Note: These sites illustrated are in the right hemisphere since the great majority of cases of topological disorientation follow damage to right-sided cortical structures. Here’s a chart of each disorder. Let’s examine some patients who have developed lesions in these areas. A patient reported by Levine and colleagues (Levine, Warach, & Farah, 1985) presented with severe spatial disorientation following development of intracerebral hemorrhages. He would become lost in his own house and was unable to travel outside without a companion because he was completely unable to judge which direction he needed to travel. The patient demonstrated a right homonymous hemianopia, but had intact visual acuity and no evidence of prosopagnosia, object agnosia, or achromatopsia. His disabilities were most strikingly spatial. He had difficulty fixating on individual items within an array, demonstrated right-left confusion for both external space and his own limbs, and could not judge relative distance. He became grossly disoriented in previously familiar places; was unable to learn his way around even simple environments; and provided bizarre descriptions of routes. 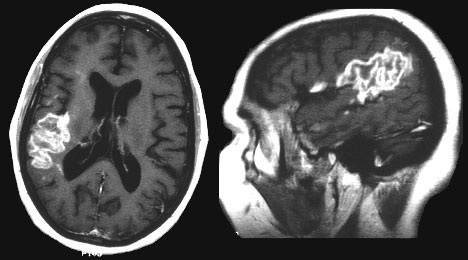 A computed tomography (CT) scan revealed bilateral posterior parietal lesions extending into the posterior occipital lobe on the left. To save you some time, I’ll break down the medical terminology for you. Homonymous hemianopia is a form of partial blindness resulting in a shared loss of vision in the same visual field of both eyes. Here’s a picture illustrating right homonymous hemianopia in this patient. Prosopagnosia is a disorder where you can’t recognize people’s faces. We actually have a built in brain function specifically designed to look at a person’s face and associate it with an identity. If you lose that function, it’s pretty interesting. Patients with prosopagnosia can’t watch television because they’re unable to identify which character is which, so they can’t follow the plot. I find prosopagnosia fascinating. In most all of us, we have a “hardware accelerated” facial recognition system. It happens without us thinking about. People with this disorder have to think about each individual aspect of a person’s face. They see an eye, another eye, a nose, a mouth, a mustache, a beard, but none of it ties together. They have to memorize identifying facial features in order to recognize someone, and they have to consciously think about it. Agnosia is a loss of ability to recognize objects, persons, sounds, shapes, or smells while the specific sense is not defective nor is there any significant memory loss. For example, you still see, but you can’t tell what you’re looking at. One of these days I’ll write a post into how our brain does object recognition, which is so interesting. Ever since I was like 16 years old I’ve wanted to know how the brain stores, processes, and recognizes objects. Achromatopsia primarily has to do with color vision. If you have this disorder, you see things in blacks, whites, and grays. Also, everything is blurry in well lit rooms. Let’s continue with our case study. [His] most striking abnormalities were visual and spatial. . . . He could not reach accurately for visual objects, even those he had identified, whether they were presented in central or peripheral visual fields. When shown two objects, he made frequent errors in stating which was nearer or farther, above or below, or to the right or left. . . . These brain areas I’ve shown you in the image above are responsible for your conception of space. When you lose them, you can’t even think in terms of spatial relationships. People with properly functioning brains effortlessly walk around and think it’s so simple that a “soul” must be controlling the body, and we must have this “free will” which controls our bodily movements. We may have some sort of free will, but it doesn’t control the body in some simple way. Your brain is responsible for these things, and it functions a lot like a computer. It’s amazing to me how this patient can’t even remember space. “It’s on the right or left, either way.” He can’t tell whether an object is distant or far. He can’t distinguish his left arm from his right. If you guys haven’t watched the lectures I posted on here the other day, you need to check them out. Dr. Murray was showing how contextual cues are processed giving rise to spatial and size conceptions. Area (1) is doing this. In healthy individuals, the brain takes the information from the eyes and processes it in such a way as to tell you about objects and their spatial relationships. This patient’s parsing system is half functioning. He can parse out objects and tell you, “Oh, that’s a coffee mug”, but doesn’t know “where” it is. You can ask him to reach out and grab it and he’ll be grasping all over the place. It must be frustrating living in that damaged brain. To see objects, but not be able to relate them in space is incomprehensible to me. The details of all of this intrigues me because you have to realize that this system is a product of natural selection. It evolved for low speeds and medium sized objects. It tells you that time flows in sequence, that these objects exist independently from one another, and that they have to be in this or that location. It tells you that a particle existing in two locations at once is “paradoxical”. It’s a very sophisticated illusion. The brain has evolved so well that it all just syncs together, and you think that time is flowing, that reality has to behave in such and such a fashion, that you control this body, that “you” have arms and legs, and so on. But no! That’s wrong. Your idea of “you” is a subjective feeling created by the body itself. “You” are something entirely different. “You” is a word created by the language system, linked to a possessive feeling which exists in your body because it is a self-replicating machine, concerned with holding on to its form so it can reproduce. But the actual consciousness, which is what you and I really are, works through the outer cortical areas of the brain. The rest of the body was made through evolution and is mechanical. The real us is some sort of undefinable “consciousness”. Call it a soul or a spirit if you like. I have to link it to a word to write it down, but it can’t be described because words can only describe physical stuff which our body can perceive. When I talk of this “consciousness”, it’s the thing that feels, tastes, sees, and hears. The brain activity produces experiences in consciousness. If we were together and I put my hand on your shoulder, you would feel my hand and I’d feel your shoulder. Those subjective feelings are consciousness. It’s linked to this physical matter, probably due to some complex vibrational pattern. But I strongly feel we’re immortal spirits of some sort. I don’t mean “Jason” is a spirit. This “spirit” I’m talking about doesn’t have an identity resembling the things human brains think about. If we had a different body, we’d live a totally different experience. It’s not some spiritual clone of this human existence. It’s something entirely different. It can sense vibrations of physical matter as we know it, and probably influence select vibrational patterns. It’s just my guess based on my own neuroscience studies. I assume its existence because I don’t see how free will can exist without it. Outside of free will though, I don’t see a reason to assume its existence. With all this talk of “consciousness”, I’m sure some of you are thinking, “Where’s your proof for all this Jason? I believe I am my physical body. You can’t tell me otherwise.” Well, ok, I’ll now bring out the proof. The possessive feelings which people falsely identify themselves with are illusions created by the body itself for its own survival. Let’s talk about neglect. Here’s a case study from a real patient who developed this brain lesion. Neglect is more common and more severe with right than with left brain damage. I will refer mostly to left-sided neglect following right brain damage, although similar deficits are seen sometimes following left brain damage. A 65-year-old woman presented to the hospital because of left-sided weakness. She was lethargic for 2 days after admission. She tended to lie in bed at an angle, oriented to her right, and ignored the left side of her body. When her left hand was held in front of her eyes, she suggested that the limb belonged to the examiner. As her level of arousal improved, she continued to orient to her right, even when approached and spoken to from her left. She ate only the food on the right side of her hospital tray. Food sometimes collected in the left side of her mouth. Her speech was mildly dysarthric. She answered questions correctly, but in a flat tone. Although her conversation was superficially appropriate, she seemed unconcerned about her condition or even about being in the hospital. When asked why she was hospitalized, she reported feeling weak generally, but denied any specific problems. When referring to her general weakness, she would look at and lift her right arm. Over several days, after hearing from her physicians that she had had a stroke and having repeatedly been asked by her physical therapist to move her left side, she acknowledged her left-sided weakness. However, her insight into the practical restrictions imposed by her weakness was limited. Her therapists noted that she was pleasant and engaging for short periods, but not particularly motivated during therapy sessions and fatigued easily. Three months after her initial stroke, obvious signs of left neglect abated. Her left-sided weakness also improved. She had slightly diminished somatosensory sensation on the left, but after about 6 months she also experienced uncomfortable sensations both on the skin and “inside” her left arm. The patient continued to fatigue easily and remained at home much of the time. Her magnetic resonance imaging (MRI) scan showed an ischemic stroke in the posterior division of the right middle cerebral artery (figure 1.1). Her lesion involved the posterior inferior parietal lobule, Brodmann areas (BA) 39 and 40 and the posterior part of the superior temporal gyrus, BA 22. A little later, the textbook further describes how patients deny their own limbs. Sometimes they even grow to hate their limbs. Personal neglect refers to neglect of contralesional parts of one’s own body. Observing whether patients groom themselves contralesionally provides a rough indication of personal neglect. Patients who ignore the left side of their body might not use a comb or makeup, or might not shave the left side of their face (Beschin & Robertson, 1997). To assess personal neglect, patients are asked about their left arm after this limb is brought into their view. Patients with left personal neglect do not acknowledge ownership of the limb. When asked to touch their left arm with their right and, these patients fail to reach over and touch their left side (Bisiach, Perani, Vallar, & Berti, 1986). A phenomenon called anosognosia for hemiplegia can also be thought of as a disorder of personal awareness. In this condition, patients are aware of their contralesional limb, but are not aware of its paralysis (Bisiach, 1993). Anosognosia for hemiplegia is not an all-or-none phenomenon, and patients may have partial awareness of their contralesional weakness (Chatterjee & Mennemeier, 1996). Misoplegia is a rare disorder in which patients are aware of their own limb, but develop an intense dislike for it (Critchley, 1974). As you can see, without that brain module telling you, “Care about this body part. This is your body part” “you” cease to care about it. People are capable of neglecting any part of their body. They”ll shave one half of their face but not the other! They see the other half of their face but don’t attribute it to themselves. It’s no different than their toothbrush. Bizarre indeed! Brain damage pulls up the curtain and shows us that it was all a grand illusion. The “body” you see in the mirror every day isn’t you and never was you. It’s just a mechanical machine that the real you can currently interact with. If free will exists, consciousness is responsible for it, but that’s not to say it’s simple. It’s very complicated, if it exists at all. The brain is computing, calculating, and going about its business, and for the most part, I think we’re just dragged along for the ride. We seem to be able to nudge it here and there, but it’s primarily an automated biological robot. Unfortunately, it’s 1:30 AM and I’ve just barely scratched the surface of today’s research alone. *Sigh*. I don’t typically write about my research because there’s so much! I’d have to write a book. I haven’t finished talking about egocentric disorientation. I realize that this post is getting really long, so I’ll probably continue this later with a part II. For a final end note, I want to say there’s more to this reality than what our senses are telling us. The light which our eyes perceive and process into space is only a sliver of the electromagnetic spectrum. Waves of all sorts are passing through our bodies as we speak, but we don’t sense them. Neutrinos make their way through the universe and nobody notices. The matter which we feel with our hands is only a minor constituent of the universe which we know about from physics studies. The vast majority of our universe is dark matter and dark energy. We live our entire days in an illusion which is generated by a sliver of the matter and energy that’s out there. As vast as the perceptible universe is, it’s a tiny fraction of what we know about – and we’ve probably just touched the surface as to what’s out there. Tomorrow, if I have time, I’ll write about heading disorientations, landmark agnosia, and anterograde disorientations. I got sidetracked talking about consciousness. I’ll try to stay more focused next time, and direct the post on spatial cognition (which was my original intent for this post too, but oh well).